My credit union changed their security procedures. They told me that if I logged in from a new device I’d have to answer some questions, which I assumed to be the challenge questions I submitted when I set up the account. No. I wanted to set up access from my iPhone, and discovered they were questions from my database dossier. One question was about the street I lived on in Oklahoma City in the late 1970s and early 1980s. Now that is seriously scary. follow me on twitter: @MikeChristie220 I tweet whenever I publish a new blog entry. I thought the the following by Melinda Henneberger in the Washington Post captured well the initial impression conveyed by Pope Francis in comparison to his predecessors. The views come from Catholic scholar J. Bryan Hehir. J. Bryan Hehir, the former head of Catholic Charities and of the Harvard Divinity School, arrived a smidge late Thursday to the Kennedy School class he teaches on the ethics of war, and tried to jump straight into his planned lecture on humanitarian military intervention. His students, however, had other ideas: “Can you talk about the pope, please?” one asked. Hehir is one of the most interesting thinkers in the church, so of course he could: When the charismatic John Paul II first stepped out onto that loggia overlooking St. Peter’s Square right after he was chosen to lead the church, he thought, “he overwhelmed the crowd.” When scholarly Benedict ventured out onto the balcony, “he taught the crowd,” and when humble Francis “stepped onto that platform, he related to the crowd.” What that shift will really mean, for and far beyond the world’s 1.2 billion Catholics, no one knows. Terry and I spent two nights in Carmel last weekend. 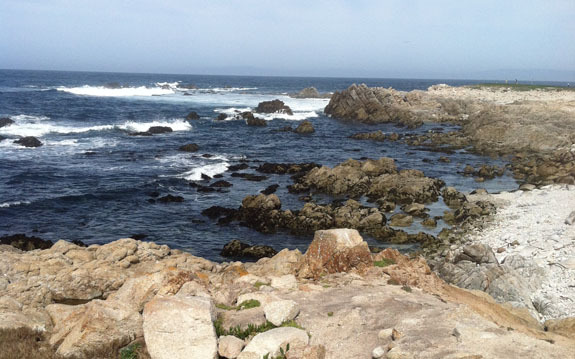 We’ve stayed other places in the Monterey Bay area, but never in Carmel proper. We were at the Sea View Inn, a marvelous little B&B between the village and the ocean. We’re about an hour from the Monterey Peninsula, so I appreciated it that when I called to make reservations the innkeeper referred to us as local. She reiterated that when we arrived. What surprised me though was that the person who helped us at the hat shop in town said the same thing. Terry was looking for a fedora to go with her rain coat and found exactly what she was looking for. The shopkeeper gave us a 20% discount. 10% for being local and 10% for our anniversary. How nice is that? The village is pleasant and fun to walk, though some of the stores and restaurants may be a tad pricy and pretentious. But except for the far West and East ends of town all of the parking is parallel. I don’t do parallel. We took the 17 mile drive. I didn’t know that it was on the private property of the Pebble Beach resort, and that the cost is $9.75 to make the loop. 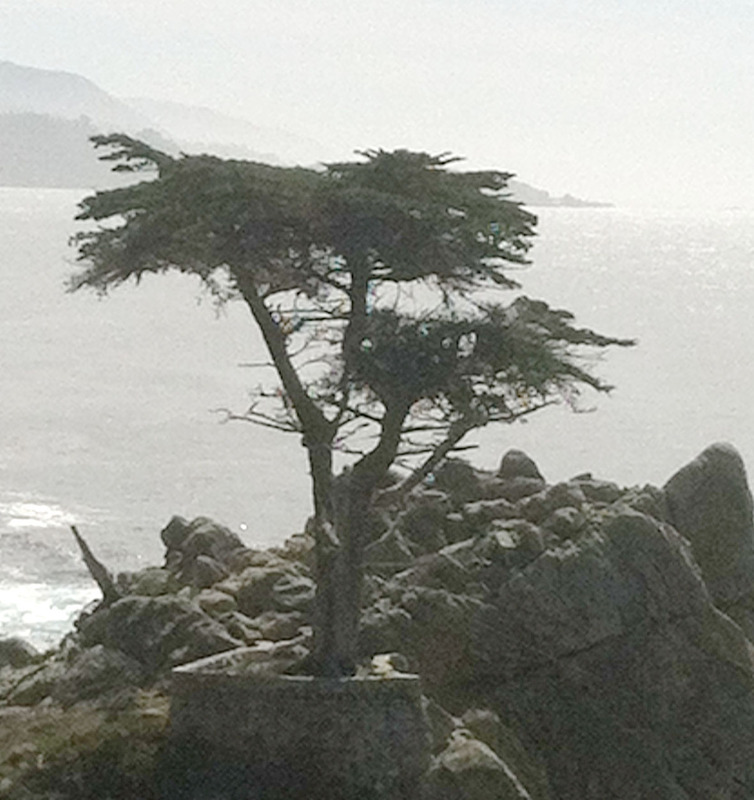 Nor did I know that that is where the famous Lone Cypress is. But it was a marvelous drive with some spectacular coastline to enjoy. Time at the ocean is always a good thing. Like many others, I have been caught up in the conversation around Pope Francis. My Catholic and Episcopal Facebook friends (and others as well) have offered up more reading material than I have been able to consume. At this point I am having trouble sorting the material out and remembering what I’ve read where. Particular thanks, however, go to Fran Rossi Szpylczyn and Jane Redmont. In spite of the overwhelm, I’d like to offer a few thoughts. I was listening to the Political Junkie segment on NPR’s Talk of the Nation when the host, Neal Conan, announced that those waiting in St. Peter’s Square had seen white smoke. NPR immediately cut away from the regularly scheduled segment, of course, and went to their reporters in Rome. All of us who were tracking this remember what seemed like a long wait from the smoke to the announcement. Terry and I went off to lunch at our regular Mexican restaurant. While they normally had The Cooking Channel on the TV there, they instead had the Bay Area NBC affiliate on, which was broadcasting the coverage from NBC news. The network was, of course, doing their best to fill time until the announcement. The sound was down on the television, but midway through our lunch the text told us that the new pope was Cardinal Jorge Bergoglio of Argentina, and that he had taken the name Francis. First pope from the Americas. The first pope to take the name Francis. And, of course, he is the first pope not from Europe in a thousand years. Like others, I’ve reflected on his humility and his concern for the poor. I’ve thought about how he didn’t live in the cardinal’s palace, cooked his own meals, and took public transportation. And like others, I’ve reflected on his conservative views on gender, marriage, and sexuality. But given the available pool of candidates the latter was inevitable whoever was selected. We’re already seeing signs that as pope he is going to be doing things differently. Three examples of words and actions after his selection. I quote and steal, but all of this has been reported publicly. He did not take the waiting limousine back to his temporary residence. He rode the bus with the other cardinals. I thought of Francis of Assisi. Then I thought of the wars, while the vote counting continued. And Francis is the man of peace. And thus came the name, in my heart: Francis of Assisi. And he is for me the man of poverty, the man of peace, the man that loves and guards creation. At this time we have a relationship with creation is not very good, right? He is the man that gives us this spirit of peace, the poor man. How I would like a church that is poor and for the poor! It might, it just might. be a new era. Those are my reflections. That and $3.25 will get you a grande decaf cappuccino. My friend Mars (that’s her name) posted the following on Facebook. I think I need to have this tattooed on the back or my right hand. I have decided to embrace the perfect moment that is now. And try my best to make now right. I know that I shared this just last May, but in light of our anniversary yesterday and looking to our anniversary getaway to Carmel tomorrow, I have to reiterate that we’re still having fun and Terry is still the one.